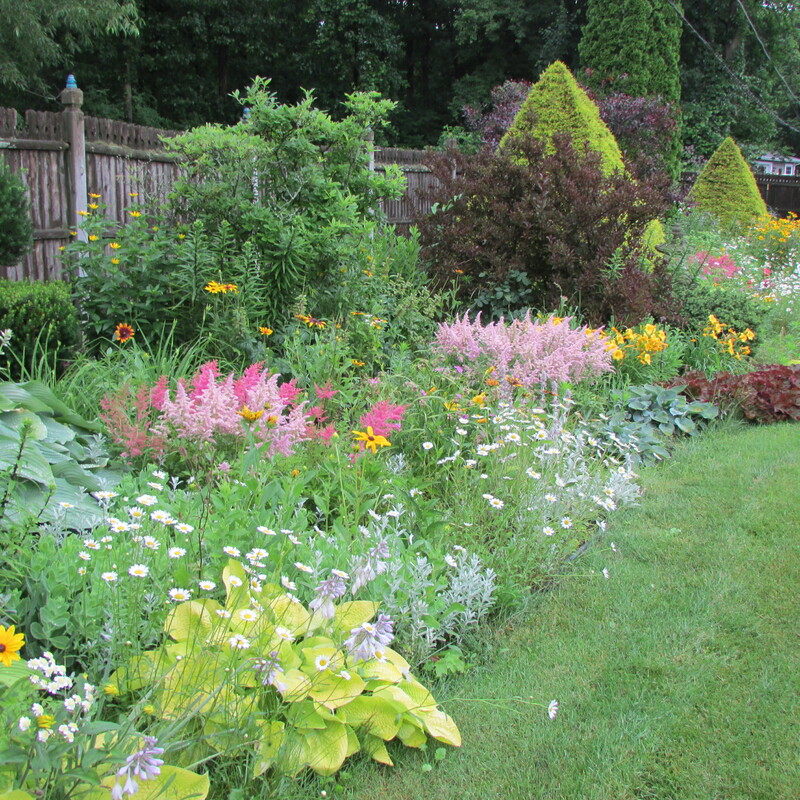 Over the years I’ve given my readers a photographic tour of my garden, showing them what it looked like at its peak, which occurs somewhere in the middle-end of July when most of the Summer blooming perennials and annuals are at their best. For this post I’m showing you what it looks like right now, in June, after I’ve so far, by myself, hand dug into the dirt (I’m not calling it soil because it’s just too worn out) twenty four 3.8 cubic feet bales of sphagnum peat moss to amend it. I did not amend every square inch of the garden, just the spaces where I plant annuals, because for the last two years things started to not grow that well. It was time to do this labor intensive project, because while working the peat moss into the ground I rarely saw a worm and the sphagnum moss that I initially worked into the ground years ago had disappeared leaving just the gravely-sandy dirt that I started with. Twenty four bales was just enough to do the front garden, my newly designed vegetable garden (which will be shown in the next post) and a new space where I’ve decided to plant the dahlias that I keep from year to year. So let’s start the tour… The cover photo for this post and the above shot are views of out front looking down toward the road (click on photos to enlarge). The pinks, blues and purples of the peonies, lupine, iris and perennial salvia have past and the garden has now taken on the warmer colors of yellow, orange and red. 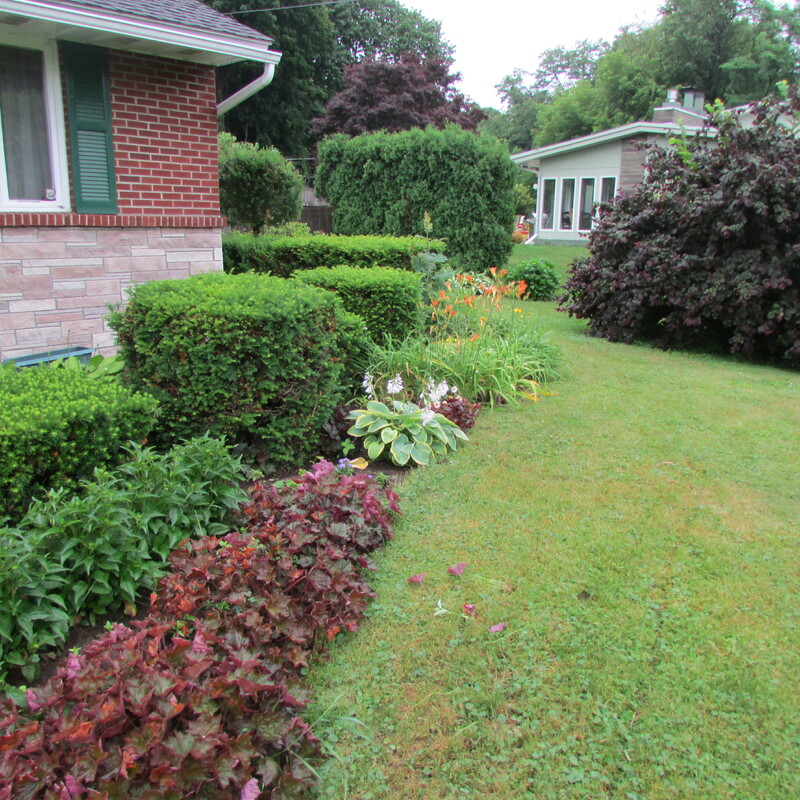 If you look closely at this side of the border you will see spaces between the clumps of perennials, this is where I plant oh-too many annuals. 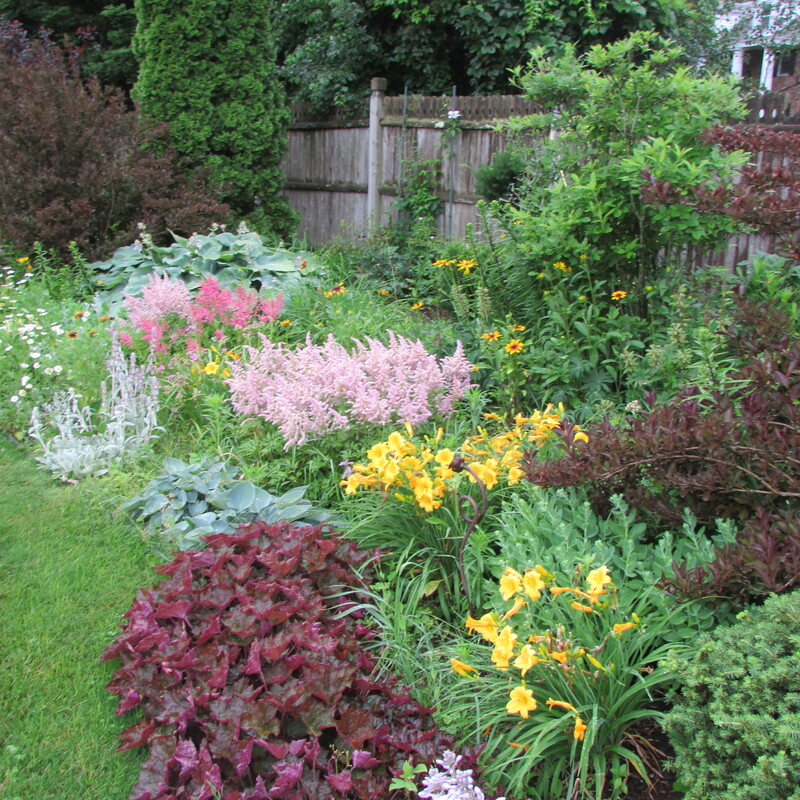 I like the perennials because they come up every year and add structure to the garden, but I also want a lot of color for a long time, which only annuals provide. 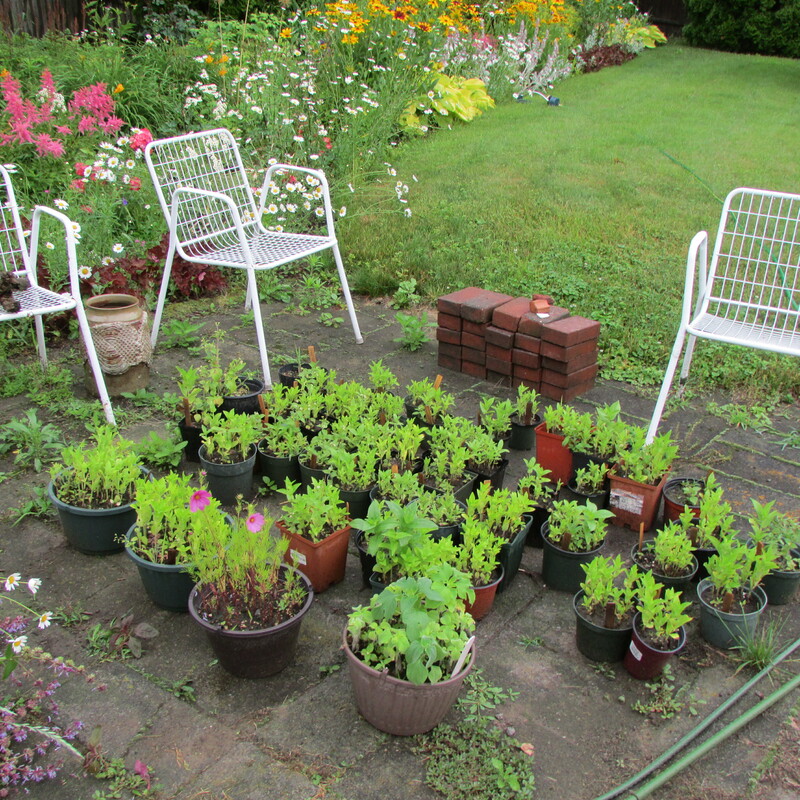 When it comes to annuals, I buy some, probably start too many zinnias from seed and every year the sweet alyssum comes back because I leave them in place over the Winter and they self-seeds. In the Spring I know what the baby plants look like and I have just enough to move around and replant again. The above photos show the Stella de oro daylilies in bloom, the Marguerite and Black-eyed Susan Gloriosa Daises starting to come, a couple knock-out roses doing their thing and a look at the annuals: sweet alyssum, salvia, annual blue salvia, blue mink ageratum and zinnia that I’ve planted. 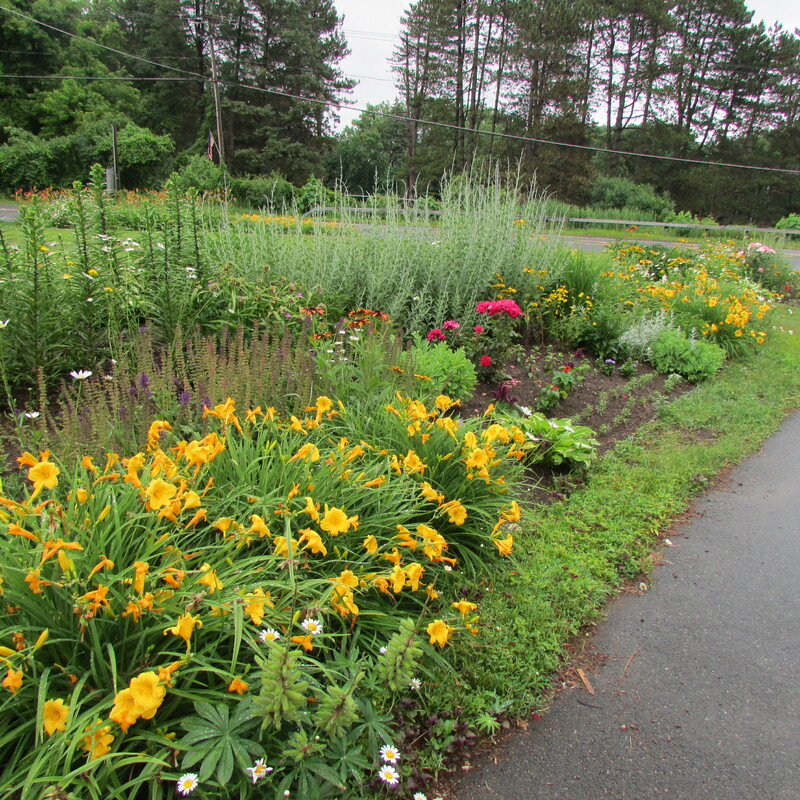 Here is a photo of the garden looking back toward the house. 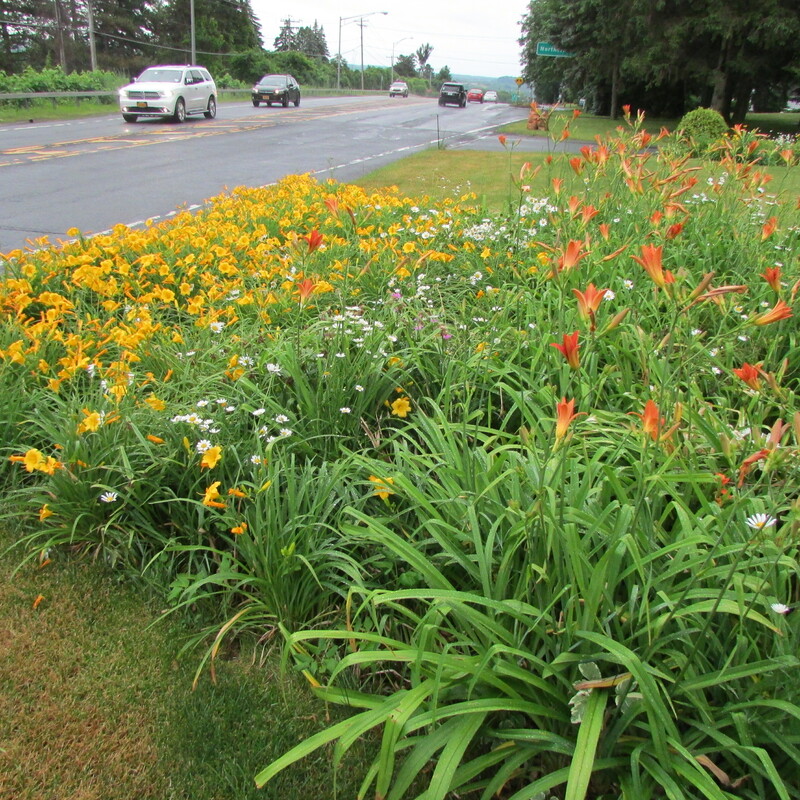 Down by the road a daylily bed filled with Stella de oro, some wild daises that have self seeded and an early and late varieties of wild orange daylilies catch the eye of passers-by. I love burgundy toned foliage because it makes green, chartreuse, gray and blue toned leaves and needles pop. 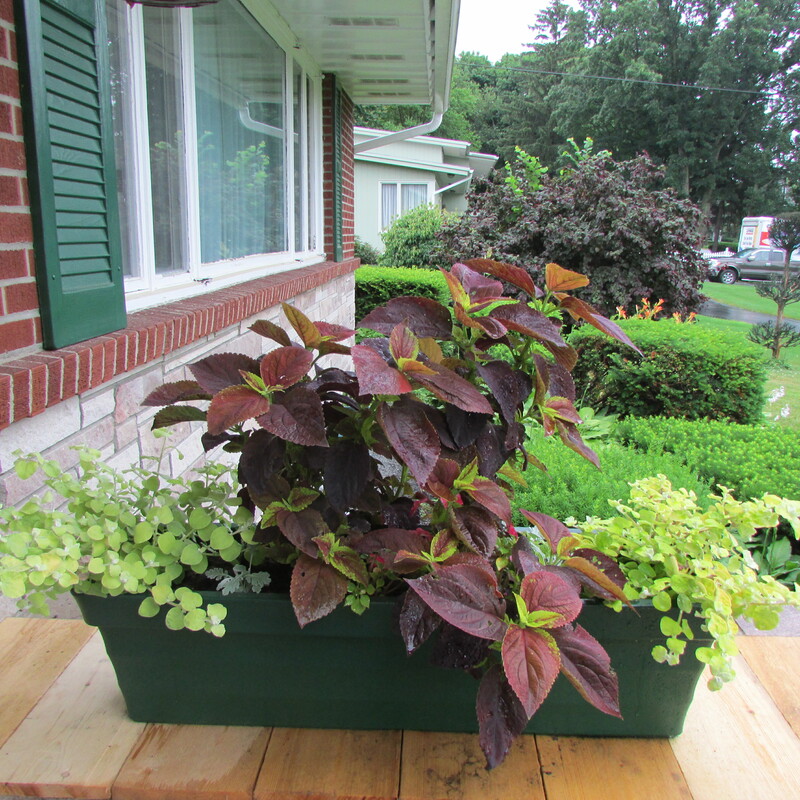 Here I used it in a new flower box, that I’ve painted green to match the shutters on my house. 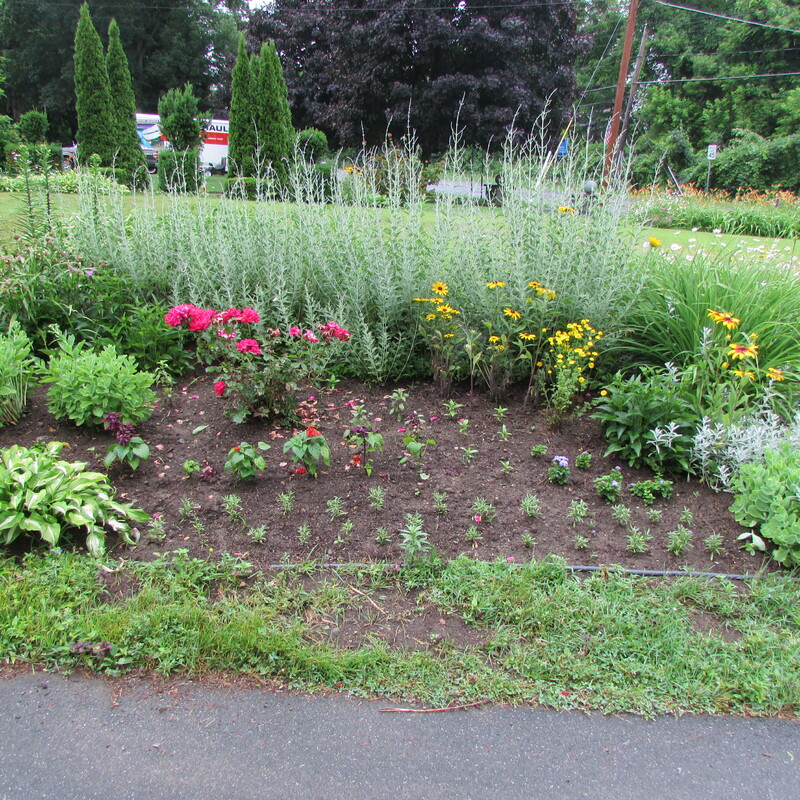 Now we’re out back looking at the garden of “Needs Weeding” which will next have its soil in spots also amended, major weeding done and planted, so it looks presentable like out front does. 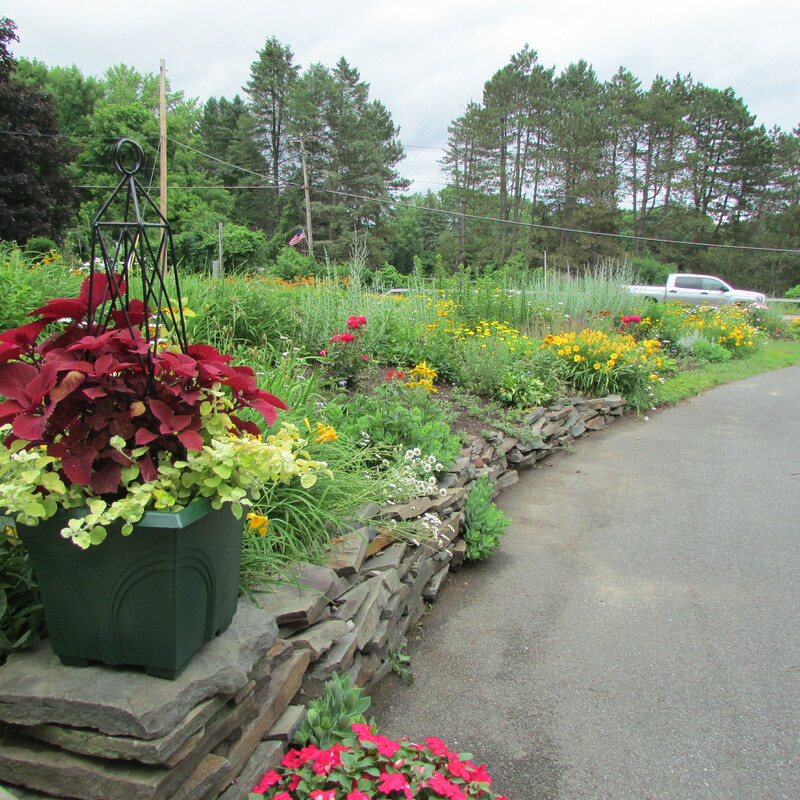 Here you see astilbe, wild daises, stella de oro daylilies and different colors of foliage doing their thing. Hopefully the rain and forecast-ed hot weather will pass so I can get the job done. More photos of out back and pots of zinnias, Mexican sunflowers, and cosmos that I started from seed to be planted in the back garden. The last three photos show some other views from outback. The top photo is of a corner of the back yard that you see when entering the garden gate. Notice the dead tree branches in the left corner of the space. Over the Winter I lost parts of a lilac bush and a sand cherry, so I clipped off their minor branches, just keeping the trunks and wired them to the fence; very sculptural and provides a lot of vertical tension in the spot, and the birds seem to like landing there. 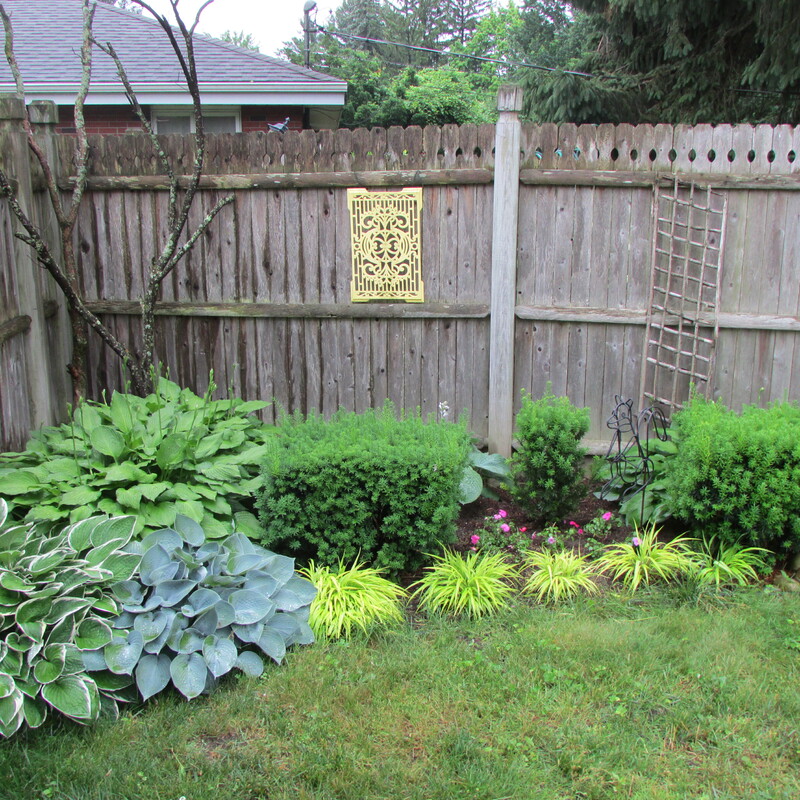 The second photo shows the three arborvitae spheres that I planted along the fence and a wonderful euonymus that was started for me, more than 25 years ago, by my Aunt Anna. I love how it’s growing up the fence and is pouring over the fence into my neighbor’s yard as her hydrangea pour over into mine. 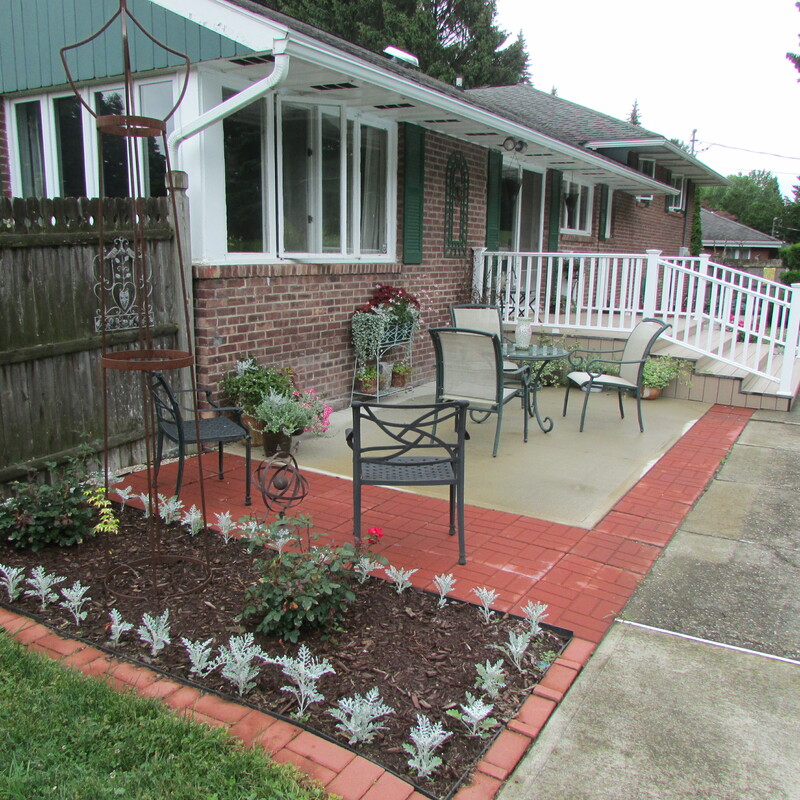 The third and final photo shows my patio area which has been prepared for the season, but until I get the garden amended, weeded and planted, I don’t think I will be lingering there too long. So there you have it a look at the June garden here at Whimsey Hill House, I hope you liked my little tour, and please look at the companion posts, as you might find them inspiring. This entry was posted in Fred's Garden at Whimsey Hill House, Roses, Peonies, Tulips, etc, The Summer Garden. Bookmark the permalink. Quick question for you, Fred… My plain old orange daylillies aren’t producing many blooms… Only three or four. I realize they are in shade, but have done well other years. Do you think it’s time to thin them? Hi there jgrazzano, too little water, too much shade and overcrowding could be one of the issues, though I think the wild variety don’t ever need to be divided, because in the wild, who would do that project. 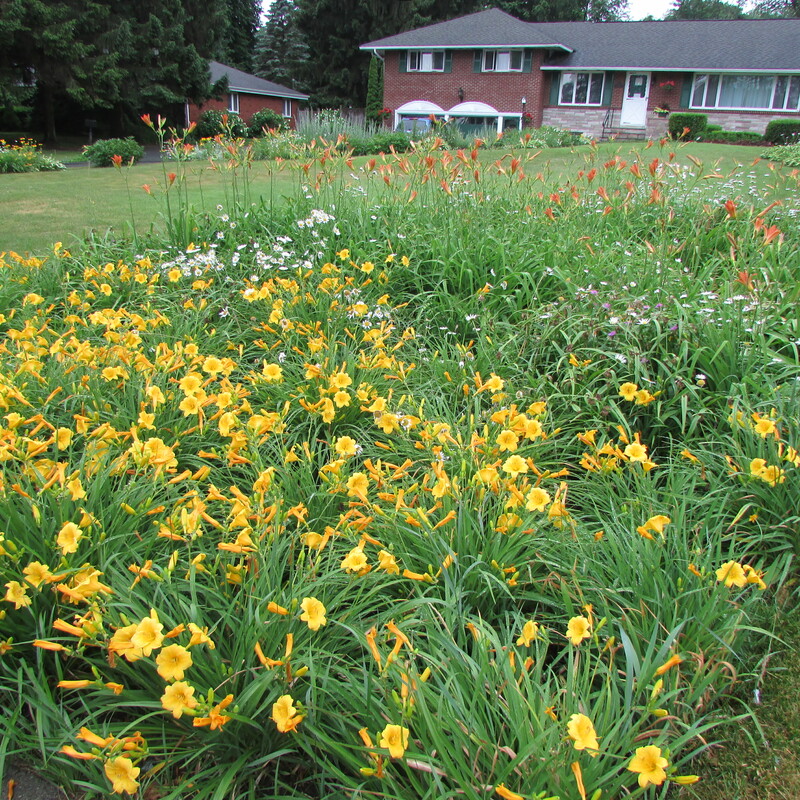 Last year I divided and planted Stella de oro daylilies at my sister’s house. Some of the daylilies are blooming just fine, as they get light and other daylilies that I planted just 10 to 15 feet away are doing nothing, because they are on the edge of shade that is just too much for them to produce flowers. My sister had trees trimmed, so hopefully next year they will do something again. Thanks for sharing your garden with us. 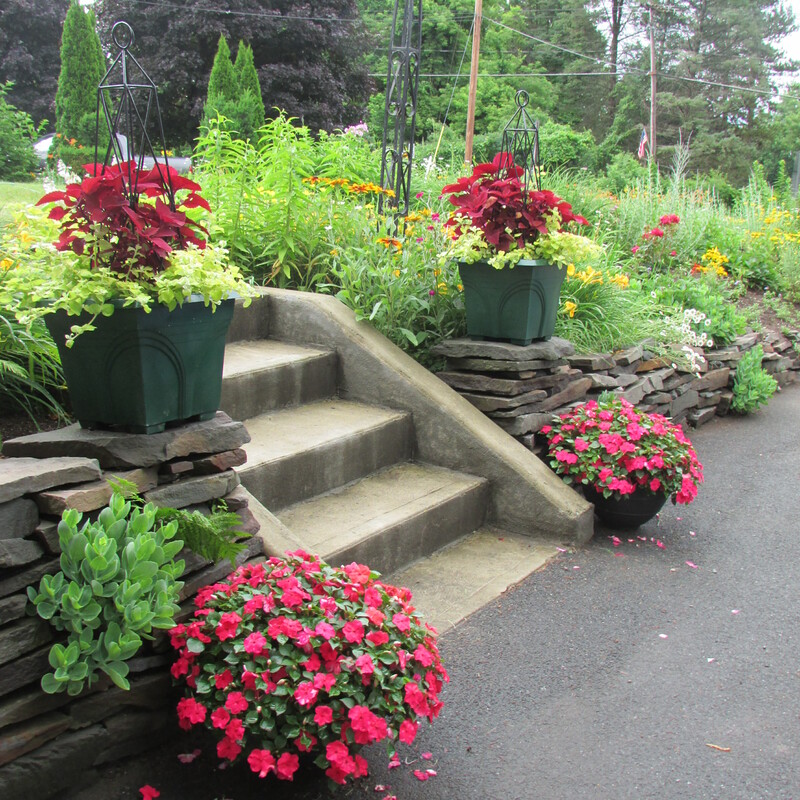 Gorgeous plantings abound! Whew! That must have been several days of heavy garden work, but it surely pays off. I think few of us remember the importance of soil ammendments. Ammendments enrich the soil, and —if placed as a top dressing— protect from heat, protect from drought and also from the extreme cold. 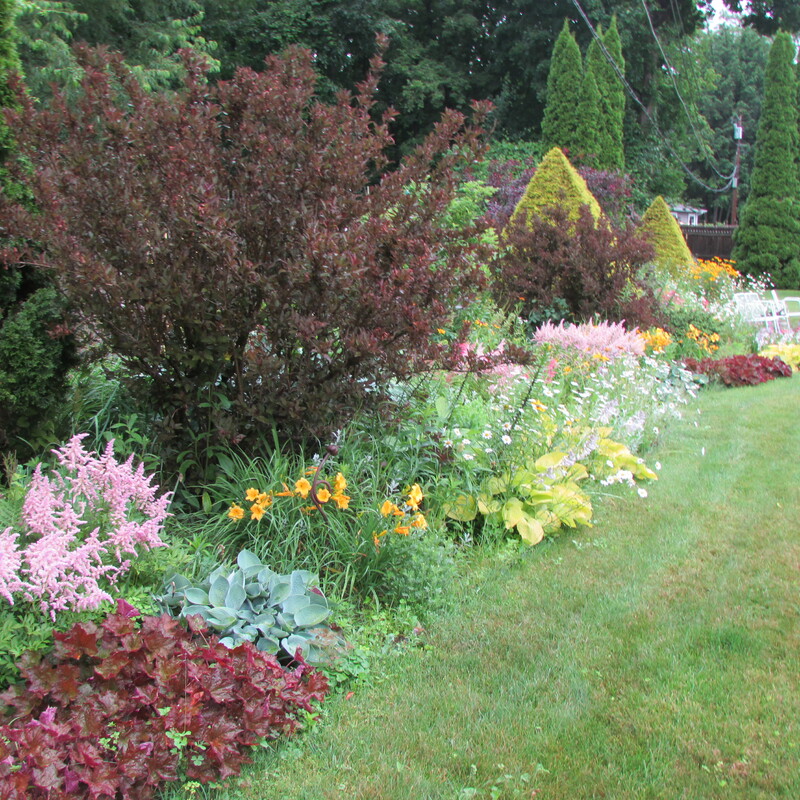 I like finely shredded bark mulch and use it for all those reasons throughout the year. If used as a top dressing, I later mix it into the soil once it has had time to break down a bit. I use other soil conditioners, but shredded bark is my favorite. Hi there Suzanne, not several days, but several weeks and at the same time I’m working on my sister’s garden. Before my mother died, her garden was really worn out and wished I could replant it, but I did not have the time, because I was taking care of her. My next post is of how I redid the vegetable garden, which I worked on for a while before starting on the garden. This year seems to be a year of renewal for my garden and I will chronicle the projects on this blog. Goodness, there are so many arborvitaes and other evergreens. What are they yellowish pyramids? They look like golden arborvitae or lemon cypress, but I doubt that lemon cypress would look so good shorn like that. Hi there Tony, they are golden string/thread Cypress, and if you read my post How to Trim a Golden String/Thread Cypress into a Pyramid you will see how I did it. Oh no. Those are too cool to prune as pyramids. I suppose they are not such a rare commodity there. Hi there Tony, if the Cypress is allowed to grow naturally it looks like “Cousin It” or a really big haystack. Years ago I just took a chance and thought what the hell, if it works it works, if it doesn’t, well I’ll do something else. For me it worked, as I like the formal presence in the garden that they give. Although I like formal pruning in the right situation, I would find it difficult to do it to certain evergreens that are considered to be that ‘fancy’ here. I see them in Oregon as common as junipers here, and it makes me cringe when I see them shorn. It also seems like they would take more work than other conifers because (here) they get roasted when the exterior gets pruned away to expose inner growth. I think that if I were to do it, I would shear them before winter was over so that they could get new foliage before late spring, and then just let them grow through summer without shearing, and hope that they would grow evenly! One advantage of shearing is that it enhances the yellow color. Hi there Tony, I shear mine in late October to the beginning of November when the garden is all cleaned up, as shearing any other time would be a messy project with plants growing around them. 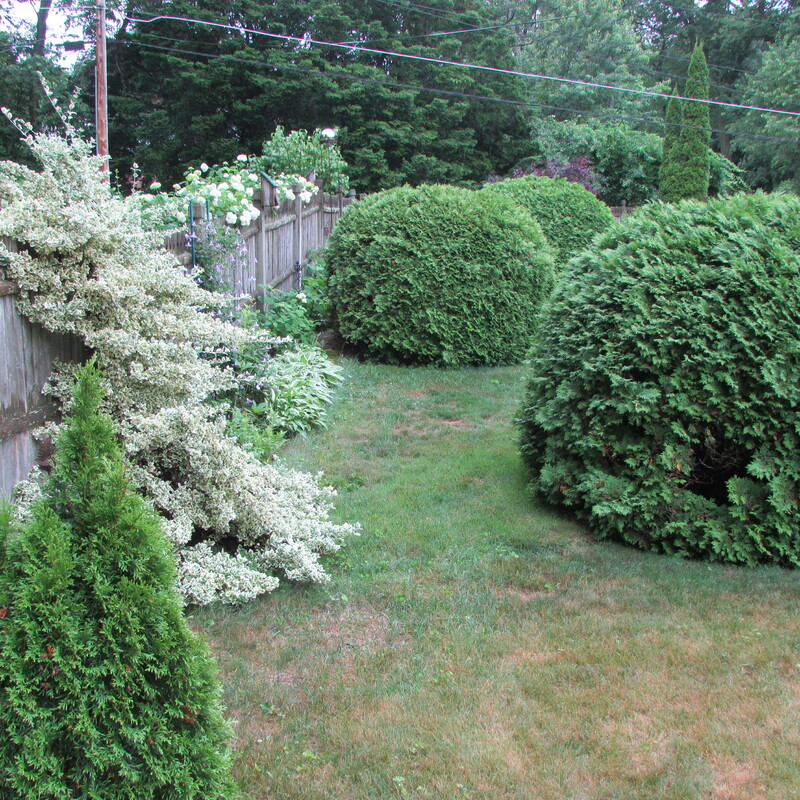 I shear the Cypress once a year and the global arborvitae (also seen in the post) every two years, also in the Fall. 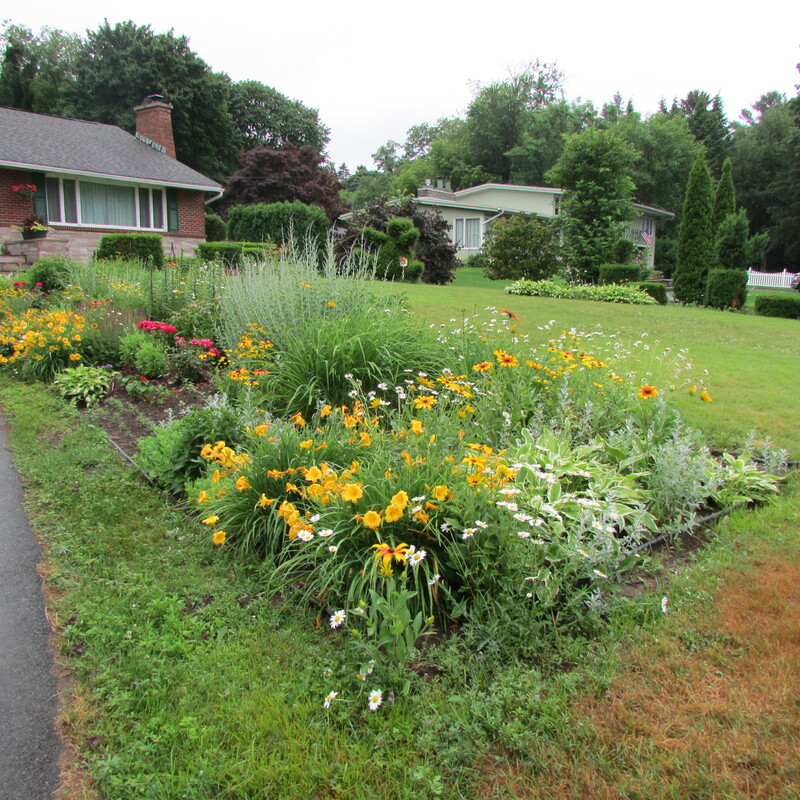 If you have a minute look at my post titled A garden tour of my property.. It might be Spring, but You should be thinking Winter Interest. In an earlier comment you wrote “Goodness, there are so many arborvitaes and other evergreens”. I’m really into having interesting things on my property to look at all during the year. To me gardening is really about making a visual picture that you can walk around in, not so much about the flowers themselves. The flowers, bushes and trees are nothing more than shapes and textures that I group with each other, or let grow next to each other, to make an interesting view/picture for my eyes to look at. Having an art degree, the plants are like dabs of paint on a canvas that changes during the year. The tag line for this blog is Your eyes deserve to view beauty…, and the way I compose things is just my vision for what the garden here at Whimsey Hill House should be, which in the end makes me happy. Shearing or butchering it’s all in the eye of the beholder, though being in the north-east where topiary, parterres and other kinds of trimmed trees, shrubs and bushes are seen at many great estates in the Berkshires of Massachusetts, Litchfield County of north-west Connecticut and at the homes of “weekenders” in the lower Hudson valley, things like that are considered very upscale and suggest money spent. Having toured those areas many times, I’m always inspired by what they have and try to reinterpret some of those land decorating ideas here in a more cost effective way here. I do wish though that I had help, like the owners of the great estates do, it would be soo much easier on me. How amusingly opposite. Formally symmetrical shearing was once popular in some of the old gardens of those who came here from the East or from Europe, but Californian landscaping is much less refined, and some might say too relaxed. I happen to like ‘some’ of the formal shearing. The problem is that no one does it properly anymore. It is very often done only because the hedge shears are the only other tool besides the mowers and edgers that ‘gardeners’ will use . . . and they use it on everything within their reach that is not lawn. That gives formal shearing a really bad reputation. In my own garden, I would only use it on functional features such as hedges, but not on topiary. I would prefer to use my time on other projects. Since I am a horticulturist rather than an artist, I am more concerned with the the performance of the plant material than what it looks like. Some of the more utilitarian plants are not very attractive. 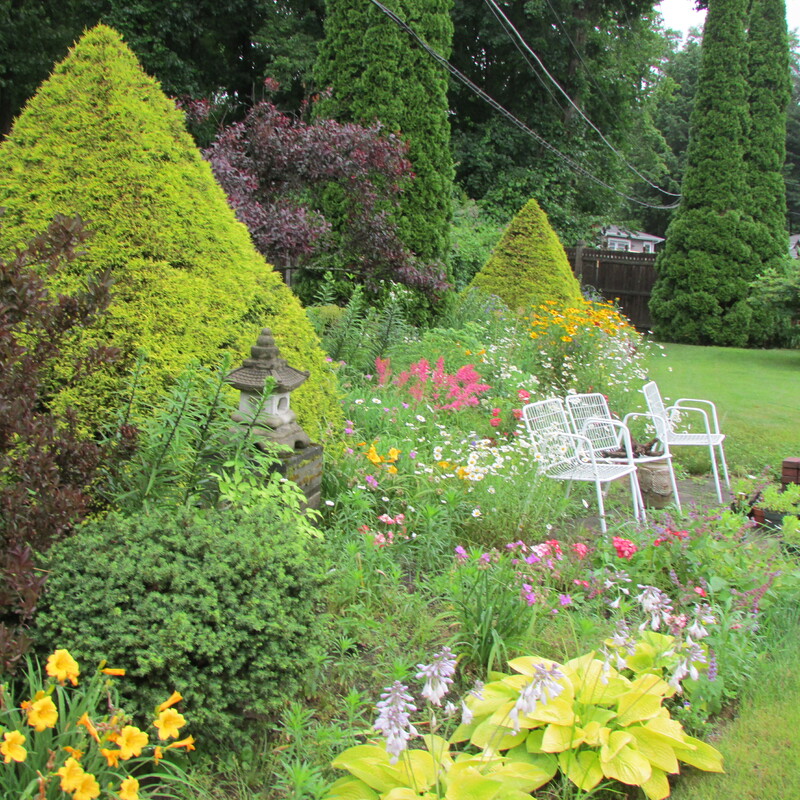 Many designers here keep their landscapes interesting throughout the years by continuing bloom throughout the year. We have no season in which nothing will bloom, and there is plenty of colorful foliage that lasts through winter. It is nice in other landscapes, and I do happen to like flowers, but keeping them blooming through the year is not a priority for me. Well said, and I now know I’m interacting with a person from California with a completely different growing environment from mine. As with everything, to thine own self be true. Nooooooooooooo! Oh Fred! Now I have to spend my weekends outside working Too! I haven’t finished Inside yet! You Are a troublemaker for me! LOL!! Thank you again for sharing..Just Love how you’ve brought “balance” and interest into gardens as you’ve done for me Inside my home.Thank you once again for sharing your talent and TIME given freely to us Fredders.. X! Fred, it looks amazing!!!!!!! Lots of sweat goes into accomplishing all of that! Lol! I want to try that one time and see if I melt ! Fred! I am speechless. I don’t even know where to begin. So much joy! I love it. Have you ever written about saving dahlias? If not, can you? I have discovered my deer are not interested in them! How do you save them? Thanks Fred! I will go take a look at it now. It is much too hot here today to go outside!